Della, racing name Jammin Joan Jett, is a 4yo petite black female who completed 94 races. She’s an absolute sweetheart who is gentle and friendly with people. She enjoys playing with stuffed toys, loves attention, and shyly seeks out affection. In the house, she’s had no issues with the hardwood floors and is quickly gaining confidence with stair climbing. She’s very food motivated and eats her meals like a champ. When crated, she is content to chew on bones or investigate treat dispensing toys. She settles quickly at bedtime, falls asleep quietly with classical music playing softly in the background. While out and about, we’ve been exploring the community and her manners on-leash improve daily. She is cautiously curious about anything that is new to her, finds flower gardens and lawn ornaments particularly fascinating. She does show an interest in small critters in the neighborhood but can be easily redirected. 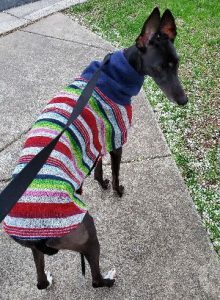 That said, she has been getting along great with the resident greyhound and on a recent trip to the pet store, showed little interest in cats there. Della would be a great additional to any pack but would also be fine as an only dog. 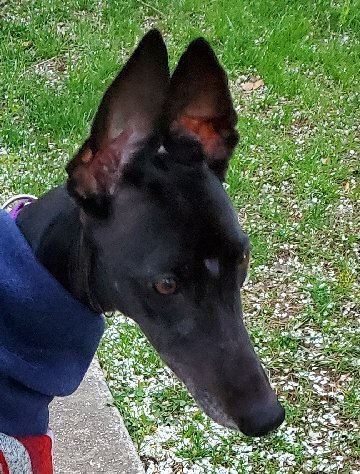 She will be available for approved adopter visits starting 04/19/2019.